Have you ever experienced the sense of relief that comes with turning the lights on after a sudden nighttime power outage? 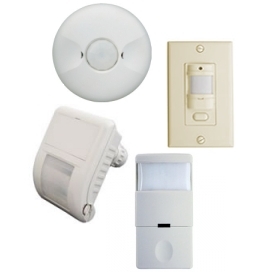 Motion sensors, or occupancy sensors, bring the same relief and don’t require an act of electrical failure to do so. These power-saving gadgets turn lights on/off based on the ability to detect a human presence or not. By installing the best motion sensor for the area, you’ll save energy, money, and won’t have to remind everyone when to turn off the lights! Which sensor is best for your environment? There are three types of sensor technologies to choose from: passive infrared (PIR), ultrasonic and dual-technology. After choosing the right technology, pick which application – a wall switch, ceiling sensor, or wall sensor – to use for your area. For most areas, especially in the home, a wall switch or ceiling sensor will bring the best results in sensing movement. A wall sensor is better for places like a warehouse. Wall switches and ceiling sensors are more commonly used for ultrasonic sensors. When a space calls for both PIR and ultrasonic sensors, like a conference room or lecture hall, a dual-technology sensor is the best option. Because of the versatility of dual-technology sensors, any application can be used. Just keep the size of the area in mind when choosing. For example, conference rooms and lobby areas can use any application while classrooms and lecture halls should use ceiling sensors. If lighting accounts for 35-45% of the energy usage in your home like it does for office buildings, installing a motion sensor can significantly reduce lighting costs. According to EnergyStar, you can boost energy savings by more than 80% using daylighting controls and occupancy sensors. As energy costs continue to go up and new standards are set for lighting (such as the phasing out of the incandescent light bulb), keeping on top of the best energy practices saves you the hassle of making drastic changes in the long run. Even better, the short-term benefits are just as significant.